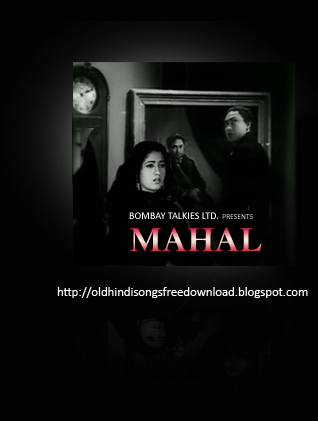 Free Download Mahal 1949 Songs: Mahal was released in the year 1949, directed by Kamal Amrohi, produced by Bombay Talkies and starring Legendary Ashok Kumar and Mahdubala. This movie introduced two legendary stars to Indian Film Industry, playback singer Lata Mangeshkar and Venus of Indian Cinema, Madhubala, which brought them the stardom. The song “Aayega Aanewaala” made Lata Mageshkar as “Lata Mangeshkar” and is the perennial favorite of many. Rajkumari was the other playback singer for this movie. The music was composed by Khemchand Prakash. The movie was a groundbreaking supernatural suspense thriller and one of the earliest known films dealing with reincarnation. Mahal became one of the biggest box office hits of 1949 in India and paved the way for Indian gothic fiction.